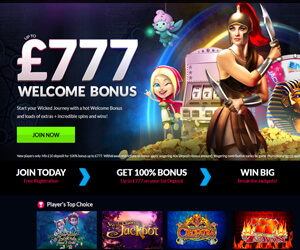 Lord Bingo News Gaming Industry Wicked Jackpots Re-Launches with New Site Design & £777 Bonus! Wicked Jackpots Re-Launches with New Site Design & £777 Bonus! Our favourite hard rockin’ casino site, Wicked Jackpots, has just revealed its new look, latest promos, and upgraded Welcome Bonus! Just when you thought things couldn’t get any hotter at this amazing site, they unveiled a brilliant new design and some of the coolest promos unmatched at any other UK casino site! First up, let’s take a look at Wicked’s new site. As soon as you visit you will be greeted by some of the characters from your favourite slots, as well as easy access to the best slots online. From the homepage, you are just one click away from popular titles such as Cleopatra Slots and Starburst plus the newest slots like Hansel & Gretel. The new interface is super easy to navigate and you can find everything you’re looking for right away. The intuitive design and clean layout makes playing at Wicked Jackpots a delightful, hassle-free gaming experience! The Welcome Bonus is another element that has been upgraded along with the site itself. Now new players can get a 100% Welcome Bonus for up to an incredible £777 Bonus! Players can use this extra bonus cash to play 450+ of the most amazing slots and casino games! Another remarkable promotion that just made its debut on Wicked Jackpots is the Wicked Wheel, a Spin the Wheel bonus with 12 guaranteed prizes! As you play at the site, the progress bar fills up and you earn spin on the wheel. Some of the amazing prizes to be won include 50 Free Spins, £50 Bonus Cash, 5,000 Coins, and a massive Mystery Prize! So don’t wait another second! Head to Wicked Jackpots and join in on the action!